Netflix is spending the first few months of 2019 continuing its quest to replace TV wholesale by expanding and diversifying its original programming, with an eye toward the 2020 election and beyond. With several competing streaming services launching in the next few years, more production houses are expected to pull their original programming from platforms like Netflix and Hulu. In preparation for this, Netflix is attempting to beef up its own archive so the loss of shows like “Friends” and movies like “Black Panther” don’t cause a notable drop in viewership. But the news that Netflix would be partnering with Gwyneth Paltrow’s lifestyle and “spiritual wellness” brand Goop raised more than a few eyebrows. Netflix has already been called out for leaning into pseudoscience before, but this may be a bridge too far. Netflix has already been called out for leaning into pseudoscience before, but this may be a bridge too far. Goop was founded back in 2008. According to the website, it was originally a “homespun” newsletter put together by Paltrow “out of [her] own kitchen,” touting “health-centric recipes” as part of the star’s transformation from an actress into a lifestyle brand. But even forgiving the faux-humble origin story — Paltrow was already an Oscar-winning, second-generation Hollywood A-lister who at the time was married to equally famous Coldplay frontman Chris Martin — Goop has always been a questionable enterprise. Paltrow’s website boasts that a week-long detox menu is one of her ten most popular posts ever read, as are stories on “flying better” and makeup products to stock up on the next time you’re in France. Her pop-up store in London sells everything from amethyst bottles (supposedly to give the water one drinks “positive energy”) to the famous (infamous?) Yoni Jade Egg. 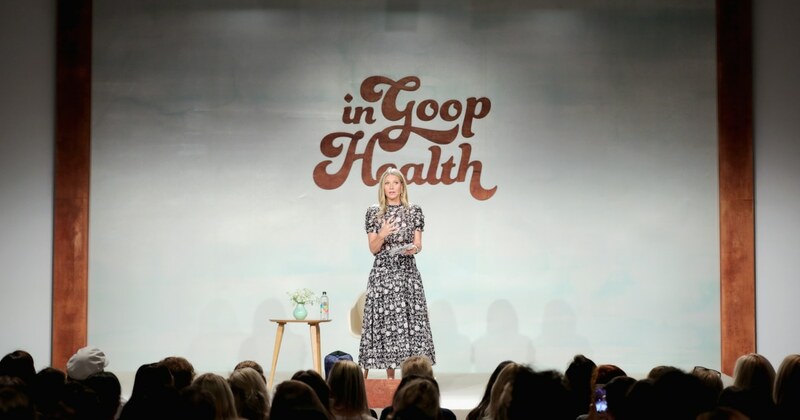 In the last couple of years, annual In Goop Health summits have attracted devotees more than happy to shell out $1500 for a ticket. This despite repeated debunkings of her brand’s health claims, and piece after piece arguing the nonsense she sells is nothing more than snake oil. And yet, neither snarky takedowns nor sober scientific analysis has dampened the enthusiasm of Goop’s true believers. Netflix wouldn’t be investing in her show (or her alleged quackery) if it didn’t think it would sell. And Goop does sell, millions a year. Part of the reason has to do with a health care system that oftentimes treats women’s pain as imaginary. Couple this with a society pushing middle and upper-class women — Goop’s presumed target demographic — to maintain impossible standards of youth and beauty, and Goop’s business plan makes a lot of sense. The 46-year-old Paltrow is perfectly positioned to sell the promise of the unattainable. But Goop doesn’t just promise devotees that they will look 33 forever. With her summits, Paltrow is telling women she cares about them, she hears their complaints about the mainstream system and most importantly, she and her Goop experts are here to help. This “help” is, increasingly, everywhere. Goop has been working hard these last few years to extend its brand across digital platforms. The Netflix partnership is just one part of this plan, which also includes an exclusive podcast partnership with Delta Air Lines, as well as an in-house podcast with beauty expert Jean Godfrey-June, food programming, and a new book club that presumably hopes to one day rival Oprah. But just because Netflix can partner with Goop doesn’t mean it should. As chief content officer Elise Loehnen tacitly acknowledged, Netflix is the streaming service with the largest reach. This fact raises a lot of complicated questions about Netflix’s responsibility as an entertainment gatekeeper. Giving this sort of messaging a high-profile platform is dangerous, especially since one assumes the series will be heavily promoted when it eventually launches. And this is also not the first time Netflix has partnered with or promoted docuseries with questionable scientific value. Last year’s “Afflicted” was called out as harmful by both advocates for the chronically ill, and by some of the participants, who said their health issues were misrepresented. The American Council on Science and Health has warned multiple times that Netflix is a major promoter of junk science programming, going so far as accusing the service of rejecting pro-science documentaries in favor of shows like “GMO OMG,” which promotes anti-GMO hysteria, and “Cowspiracy: The Sustainability Secret,” which insists eating of meat is a bigger cause of climate change than fossil fuels. Netflix would argue it is only going where the money is, just like broadcast TV and cable channels have been doing for decades. But unlike some media companies that clearly segregate serious content from more frivolous or voyeuristic fare, Netflix does not at the moment discriminate. All of its programming is jumbled together. Perhaps this will keep Netflix honest. The streaming service’s rapid growth may be partly to keep ahead of the great content cataclysm soon to come. But in its headlong rush to replace programming, Netflix is undermining and diluting its original branding tag. With Goop, Netflix is willingly getting into bed with one of its most high-profile pseudoscience series to date. Will this upset its subscriber base? Maybe not immediately. But Netflix would be wise to learn from the mistakes made by Facebook, which refused to pay attention to criticism of its content until it literally became the subject of a congressional inquiry. Because Jade eggs may seem silly and harmless on the surface. But buying into entertainment programming masquerading as scientific fact when real health problems come calling can have serious consequences. Netflix may be doing its own version of “Move Fast and Break Things” in the entertainment industry, but there’s enough disinformation being released online in the pursuit of eyeballs and page views. It’s already effected the health of our political system. We shouldn’t allow the same disease to affect the health of our bodies, too. Ani Bundel has been blogging professionally since 2010. Regular bylines can be found at Elite Daily, WETA’s TellyVisions, and Ani-Izzy.com.